Amigurumi to celebrate St Patrick's Day? Sure, why not? 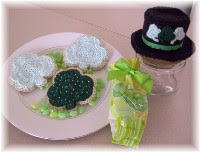 Shamrock cookies & leprechaun hat that opens to reveal treats.